The prescriptive sentences of the Vedas (specifically in the Brāhmaṇas) are considered by the Mīmāṃsā philosophers to be of central importance, and they thus argue that the Vedas convey primarily something which must be done (kārya). This focus on the deontic language of the Vedas led the Mīmāṃsā philosophers to deliberate upon several aspects on the nature of language and meaning, and two distinct theories of verbal cognition – abhihitānvaya and anvitābhidhāna – were put forth by the Bhāṭṭa and Prābhākara Mīmāṃsakas respectively. Śālikanātha (800-900 CE) is arguably the most important thinker among the Prābhākara Mīmāṃsakas, and his Vākyārthamātṛkā is the locus classicus for the philosophical presentation of the Prābhākara doctrine. In a talk presented at the 9th Coffee Break Conference on Science and Technology in Premodern Asia (University of Oxford), the project's Shishir Saxena discussed the specific manner in which Śālikanātha defines abhidhāna or denotation, how this is distinct from the corresponding conception of the Bhāṭṭas, and the fundamental significance of this definition of denotation in Śālikanātha’s overall theory of anvitābhidhāna. This theory is especially crucial to understand since, according to Śālikanātha himself, it forms the basis (mūla) for the Prābhākara doctrine that all sentences have a deontic meaning, a formerly unknown thing which must be done (apūrvakārya). What is bādha? : bādha is a way of dealing with contrasting Vedic rules, so as to know what to do when they seem to clash. E.g., what shall we do when we encounter a prescription telling us to do X and then one telling us not to do X? How is bādha dealt with? Śabara's investigation on the problem starts by asking what exactly is bādhita `blocked' in such cases. Is it something already obtained (prāpta) or not? If it was already obtained to our treasure of knowledge, how can it then later be blocked without invalidating the epistemological status of the Veda? If it was not yet obtained, how can it be blocked? The discussions on bādha become longer and longer in Kumārila's commentary on Śabara and then in Somanātha's sub-commentary on Kumārila. Somanātha explains that in case of bādha what happens is not that a later prescription or prohibition invalidates a previous one, for the reasons just said. Rather, what is blocked is only one's understanding of that precept. One thought at first that "Do X" meant "Do X in all cases", but after having heard "Do not do X in case of y", one revises one's understanding and comes to interpret "Do X" as "Do X in all cases apart from y". Thus, the initial prescription is rephrased as referring to all but the content of the later deontic statement (y-vyatirikta X). The first prescription had this restricted scope all the way long, so that no part of it is in fact invalidated, but one's belief is blocked and needs a revision. Somanātha speaks here of the need to take back one's previous opinion (buddhi-apahāra), not the existence of the epistemic content (viṣayasattva). Somanātha articulates it in terms of the opposition between a sāmānyaśāstra 'general teaching' and a viśeṣaśātra 'particular teaching'. This is tantamount to the well-known principle of jurisprudence that Lex specialis derogat legi generali, but the interesting point is how exactly this occurs. 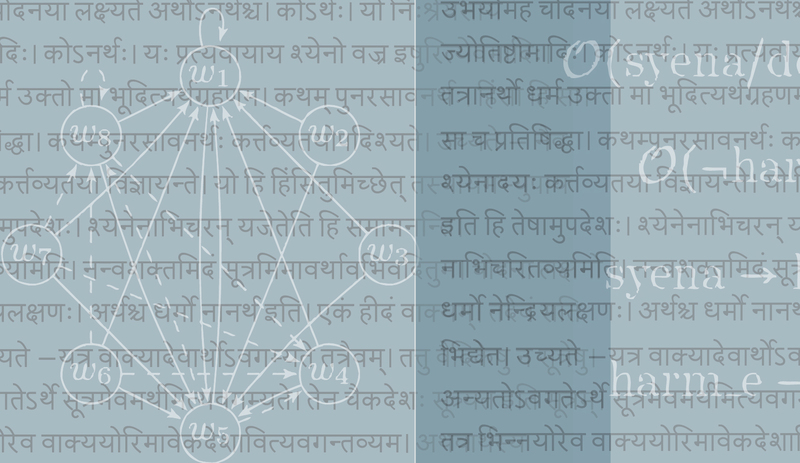 In order to avoid endangering the validity of the first prescription's source, namely the Veda, Somanātha explains that the Veda initially produced only a cognition (jñāna), which is not necessarily valid, and that a specific understanding (vijñāna, interpreted as viśeṣa jñāna) comes about only thereafter, through the mechanism of bādha. In some concluding verses he sums up the point by saying that as long as one looked at the Veda from a one-sided perspective (ekadeśa) one had a certain understanding of it. Later, through the completion of one's perspective (paripūrṇa), one also gets a full (samasta) understanding of the meaning at stake. Why is bādha relevant (for us)? It is interesting for us because it can show us new ways of dealing with such problems and it can drive out attention to problems we would not have considered otherwise. Who wrote about it? All Mīmāṃsā authors needed to deal with this problem. In a sense, bādha is the reason for the existence of Mīmāṃsā. Had the Veda not entailed any seeming contradictions, the Mīmāṃsā enterprise would not have been undertaken. Do readers share the impression that what we are dealing with in Somanātha's interpretation is a device to account for belief-revision? How are duties and obligations conceived in Mīmāṃsā? Can Mīmāṃsā contribute to the deontic logic debate by suggesting alternative ways of conceiving duties and other deontic concepts, such as permissions and prohibitions? In order to answer such questions, we looked in a text by Maṇḍana Miśra, the Vidhiviveka. This text is philosophically extremely rich, but its style is terse and hard to understand, so that no English translation has been prepared so far. The 8th c. Mīmāṃsā scholar Maṇḍana Miśra discusses exhortative statements in the Vidhiviveka by putting them all under the umbrella category of vidhi `prescription'. He distinguishes four types, namely ājñā `command', abhyarthana `order', anujñā `permission' and upadeśa `teaching'. The first three are distinguished according to the power and authority relation between the commander and the commandee. The latter category, by contrast, comprises prescriptions which are independent of the people who utter them, like in the case of laws. The main distinction between permission and the other types of prescriptions in Maṇḍana (as interpreted by his commentator Vācaspati) seems to be that other prescriptions, e.g., teaching, cause people to act, whereas a permission merely allows to someone who had already initiated an action out of her own will to continue acting. In other words, the addressee of the permission does not act because of the permission itself, but rather because of her own wish. For this reason, in the case of permissions there is no enjoined person (niyojya). Further, a teaching is distinguished from a command insofar as the latter is uttered for the purpose of the commander, whereas the former is for the purpose of the person enjoined (since there is no enjoiner for a teaching, it cannot have the enjoiner as purpose). The permission, writes Vācaspati, may behave in the same way (i.e., it is not for the purpose of the person uttering it), but still it is distinguished from the teaching since the teaching causes people to act and the permission does not. Reasoning about machine ethics is a very important and controversial topic, as witnessed, e.g., by the recent Report on Automated and Connected Driving issued by the Ethics Commission of the German Federal Ministry of Transport and Digital Infrastructure. The report points out that while genuine dilemmatic decisions can not be clearly standardized, nor can they be programmed such that they are ethically unquestionable (p.11), under certain circumstances [p]rogramming to minimize the number of victims [...] could [...] be justified, at any rate without breaching [...] the Basic Law (p.18). How can we specify such ethical obligations a program is required to meet? As suggested here, This question necessitates the study of logics of ethics and obligations. A. clarification (I definitely understood better why, e.g., the distinction between prescriptions and prohibitions is so important once I saw that "Ought not to X" cannot be translated into "Forbidden to X" and vice versa). The Mīmāṃsā principles were created for religious purpose, namely for making sense of the Vedas. Nonetheless, they were so rational and logical that they subsequently began to be used in law, grammar, logic, philosophy.